Department of Chemical Pathology, Obafemi Awolowo University Teaching Hospital Complex, Wesley Guild Hospital Unit, Ilesa, Osun State, Nigeria. Department of Chemical Sciences, Joseph Ayo Babalola University, IkejiArakeji. Department of Biochemistry, Ekiti State University, Ado Ekiti, Ekiti State. Diabetes mellitus is a group of chronic metabolic disorder characterized by a high blood glucose concentration caused by insulin deficiency, often combined with insulin resistance (Teixeira et al., 2000). Diabetes mellitus is a major cause of disability and hospitalization and it results in significant financial burden (Vats et al., 2002).Diabetes mellitus is associated with an increased risk of thrombotic, atherosclerotic and cardiovascular disease. About 70- 80% of deaths in diabetic patients are due to vascular disease (Chattopadhyay and Bandyopadhyay, 2005). Hyperglycemia, the primary clinical manifestation of diabetes, is thought to contribute to diabetic complications by altering vascular cellular metabolism, vascular matrix molecules and circulating lipoproteins (Chattopadhyay and Bandyopadhyay, 2005). Globally, as of 2013, an estimated 382 million people have diabetes worldwide, with type 2 diabetes making up about 90% of the cases. This is equal to 8.3% of the adults’ population with equal rates in both women and men (Vos et al., 2012). Worldwide in 2012 and 2013, diabetes resulted in 1.5 to 5.1 million deaths per year, making it the 8th leading cause of death (Cooke and Plotnick, 2008). The increasing number of ageing population, consumption of calories rich diet, obesity and sedentary life style have led to a tremendous increase in the number of diabetics world-wide. Pharmacological means (insulin and oral hypoglycemics) as well as non-pharmacological means (diet and exercise) may be used in the management of diabetes mellitus. The doubts about the efficacy and safety of the oral hypoglycemic agents have prompted a search for safer and more effective drugs in the treatment of diabetes (Reaven, 1983). Recent findings from our laboratory suggested that Archachatina marginata haemolymph potentiates hypoglycemic effect by mimicking insulin in streptozotocin -induced diabetic rats where Archachatina marginata haemolymph of 2ml regimen significantly improved the insulin concentration over the 1ml regimen (Adeboye et al., 2017). This is also reflected in the gradual and consistent reduction in the blood glucose concentration as opposed to the consistent increase in the diabetic control group. Since Diabetes mellitus is associated with a large number of lipid abnormalities with evidence confirming the pivotal role of hyperlipemia, mainly elevated blood cholesterol, particularly LDL cholesterol and VLDL cholesterol in the development of atherosclerosis-related disease( Pyorala et al.,1987), this study evaluate the ameliorative effect of Archachatina marginata haemolymph on physiological lipoproteins in streptozocin induced diabetic rats. Streptozotocin (STZ) was obtained from Sigma-Aldrich (Germany). All other chemicals used were of analytical grade and obtained from FLUKA, BDH (Germany) and other standard commercial suppliers. Animals Healthy female albino rats were acquired from the animal holding unit of the Institute for Advanced Medical Research and Training (IMARAT), University College Hospital, University of Ibadan. Animals were maintained with food and water ad libitum and under a 12-h light/12-h dark cycle. African Giant Snails were bought from Ipetu-Ijesa Market and taken to the department of animal science, Joseph Ayo Babalola University, IkejiArakeji for authentication. The “principle of laboratory animal care” (National Institute of Health-NIH publication No. 85- 23) guidelines and procedures were followed in this study (NIH publication revised, 1985). The ethical committee of the department of chemical sciences, Joseph Ayo Babalola University, Ikeji Arakeji approved the research work. The rats were set into four groups (n=5). Group 1- Non Diabetic Control (NDC). Rats treated with rat diet and water ad libitum. After the initial two weeks period of acclimatization, the animals were fasted overnight but allowed access to water ad libitum. The blood glucose concentration of each rat was taken and thereafter, they were weighed and then administered with 55mg/kg STZ in citrate buffer (pH 4.5) peritoneally (Garza-Rodea et al., 2010) except non-diabetic control group (NDC) that received citrate buffer only. The rats were returned to their respective cages and fed glucose laden water to guide against the immediate hypoglycaemic effect of STZ administration. 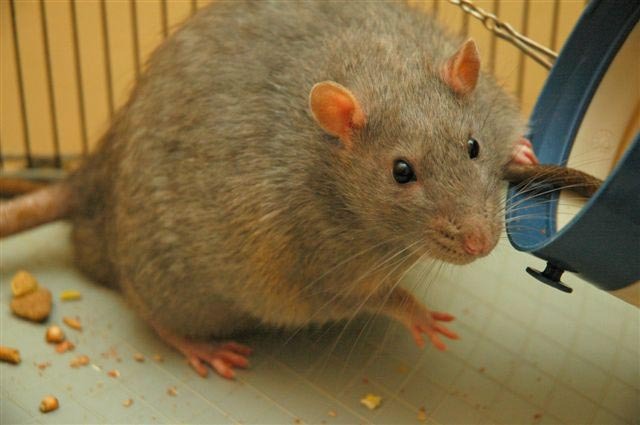 After three days, the blood glucose levels of the rats were again checked to ascertain successful diabetes inducement with the presence of hyperglycaemia. Rats with blood glucose level of 200mg/dl and above were considered diabetic and used as diabetic animals in subsequent studies. At the end of the fourteenth day administration, the animals were fasted overnight. The rats were sacrificed by cervical dislocation before slicing their carotid artery with blade and the flowing blood samples were collected into appropriately labeled Lithium heparin bottle for lipid profile analysis. The blood samples were spun at 3,000 rpm for 10 minutes using the centrifuge. The plasma was carefully transferred to appropriately label plain tube with the aid of a Pasteur pipette. Samples were immediately stored at – 4°C till analysis. Plasma total cholesterol concentration was estimated spectrophotometrically according to the method of Burtis and Edward (1999). Plasma high density lipoprotein cholesterol concentration was estimated spectrophot-ometrically according to the method of Burtis and Edward (1999). Plasma Low-density lipoprotein-cholesterol is analysed mathematically using Friedwald Equation. Plasma triacylglyceride concentration was estimated spectrophotometrically according to the method of Burtis and Edward (1999). All data were subjected to one way analysis of variance. The mean and standard error of mean were used for statistical analysis. The statistical significance between the control and each treated groups were determine using student t-test. The level of significance was set at P< 0.05. Triglyceride concentration is significantly elevated between NDC and other groups whereas the decrease between DC and DSS1/DSS2 are not significant statistically (p<0.05).NDC=13.8 ± 0.11; DC=45.90 ±7.10; DSS1=36.21 ± 1.0; DSS2=33.55 ± 1.0. Results are represented as Means ± SEM of five independent determinations of Triacylglycerol in mg/dl. Bars carrying alphabets have significant differences ( p<0.05) while those with same superscripted alphabets are not significant statistically (p>0.05). 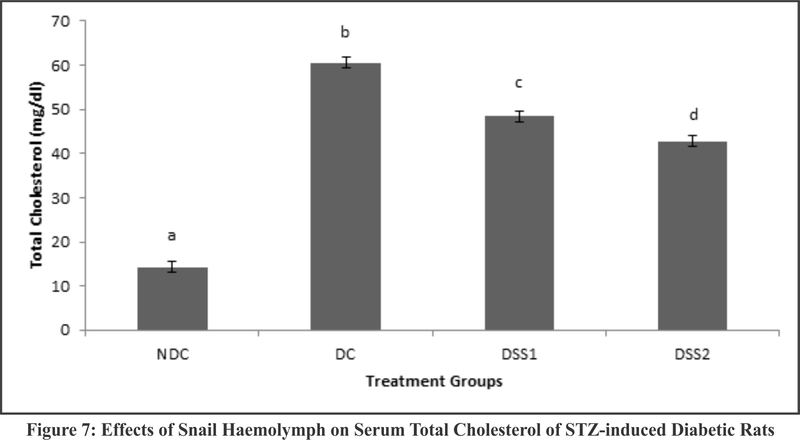 Effects of Snail Haemolymph on Serum Total Cholesterol of STZ-induced Diabetic Rat Total cholesterol concentration is significantly increased (p<0.05) when NDC is compared with other Groups. There is a significant decrease also between DC and DSS1/DSS2, DSS1 and DSS2(p?0.05). NDC= 14.25 ± 2.5; DC= 60.55 ± 1.5; DSS1= 48.41 ± 0.9; DSS2= 42.83 ± 0.2. Results are represented as Means ± SEM of five independent determination of total cholesterol in mg/dl. Bars carrying different superscript alphabets have significant differences statistically p< (0.05). LDL concentration is significantly increased (p<0.05) when DC/DSS1/DSS2 was compared with NDC and when DC was compared with DSS2. However DC and DSS1, DSS1 and DSS2 show no significant differences (p>0.05).NDC = 9.07 ± 2.50 mg/dl; DC =39.95± 5.00 mg/dl; DSS1 = 31.45 ±5.50; DSS2 = 27.56 ± 1.50 mg/dl. Results are represented as Means ± SEM of five independent determination of LDL- cholesterol in mg/dl. Bars carrying different superscript alphabets have significant differences statistically (p<0.05). 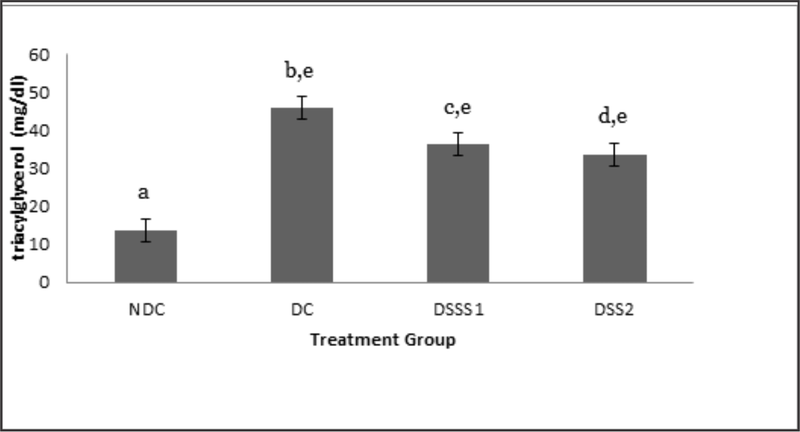 HDL concentration significantly increased (p<0.05) when DC/DSS1/DSS2 were compared with NDC .However there was no significant differences between DC and DSS1 and DSS1 and DSS2 a (p>0.05). NDC=1.91±0.80; DC=7.28±0.25; DSS1= 5.41± 0.09; DSS2=4.78±0.7. Results are represented as Means ± SEM of five independent determination of HDL- cholesterol in mg/dl. Bars carrying different superscript alphabets have significant differences statistically (p<0.05). Hyperlipidemia is a recognized complication of DM characterized by elevated levels of cholesterol, Triglyceride and phospholipids and changes in lipoprotein compositions (Segal et al., 1984). Risk of hypertension and other coronary heart diseases are associated with DM as precipitated by hyperlipidemia. 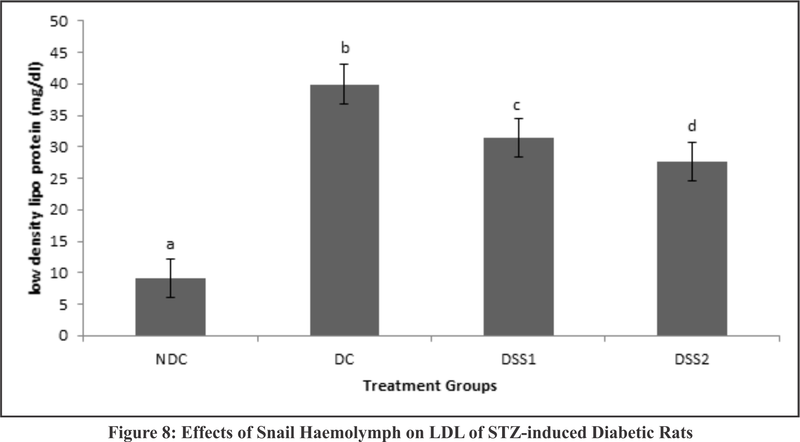 Snail haemolymph has been found to reduce both systolic and diastolic blood pressure at a slow rate (Dede et al., 2003). Snail haemolymph administration brings an apparent decrease in the lipid panel of the induced rat. Statistically, triglycerides concentration increased significantly in induced animals and are not decreased significantly by the administration of snail haemolymph in both regimen of 1ml and 2 ml though there is apparent decrease observed. Significantly, total cholesterol concentration was reduced by treatment with the snail haemolymph. The reduction by increasing the regimen to 2mls over 1 ml is also significant (p<0.05). A parallel had been drawn between hyperlipidemia and hypertension. This decrease may not be in variance with the findings of Dede et al., (2003) that snail haemolymph reduce high blood pressure by exerting hypolipidemic effect. Low density lipoprotein concentration was increased also by induction of DM with STZ. The effect of snail’s haemolymph however is apparent but not significant when 1 ml was administered but significantly reduced when 2mls was administered. Lowering of LDL being the bad cholesterol is expected to be part of the target of any useful medication for treatment of DM and its complications. HDL pattern is in variance with the early works (Berbera et al., 1997 Murali et al., 2002) on streptozotocin induced DM with the significant increase in concentration which is lowered by administration of haemolymph. HDL is the good cholesterol which is desirable as they transport cholesterol to the liver for metabolism and possible excretion of excess cholesterol as conjugates. This lowering effect needed to be investigated further. The reduction observed in lipid profile of the treated rats, thereby reducing the risk of coronary heart disease and hypertension is an encouragement. The results summarily express hope at higher concentration of administered haemolymph as significant improvement was observed in all parameters tested in the 2mls administered haemolymph over 1ml and apparent improvement of 1ml over the non-treated diabetic control (DC). 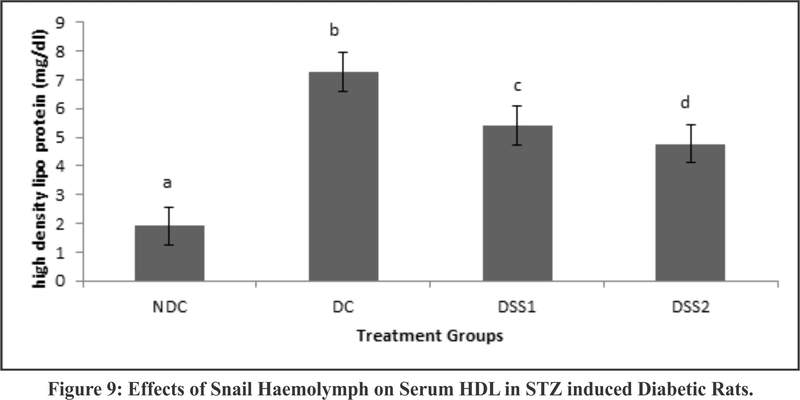 The indiscriminate lowering of HDL as observed also call for caution in the administration of snail haemolymph on diabetes. 1. ADA (American Diabetes Association) ( 2012): Economic costs of diabetes in the U.S. in 2012. Diabetes care 36 (4): 1033–46. PMID 23468086. 2. Ademolu, K.O and Idowu, A.B (2005): The use of poultry droppings as snail feed. J. Anim and Vet Advances 4(6): 556 – 569. 3. Ademolu, R.O., Idowu, A.B., Agbelusi, O.M (2006): Effects of stocking density on growth and haemolymph biochemical value of Archachatina marginata. Afr. J Biotech. 8(12): 2908– 10. 4. Adeola, M.O (1992): Importance of wild animals and their parts in the culture, religious festivals and traditional medicine in Nigeria. Environ. Conserv. 19: 25-134. 5. Akinloye, O.A and Olorode, B.R. (2000): Effect of different feeding conditions on the performance, Haemolymph Biochemical and mineral value of African giant land snail Archachatina marginata. J. of Agric. and Environment. (1): 143 – 147. 6. Akinnusi, O (1998): Introduction to snails and snail farming. Omega Sc Publisher, Lagos.35–38. 7. Akinnusi, O (2002): Introduction to snail and snail farming. Triola Publishing Company, Abeokuta. P70. 8. Berbera, A., Fernandez-Alvarez, J., Truc A., Gomis, R., Guinovart, J.J (1997): Effect of Tungstate in neonatally streptozotocin-induced diabetic rat: mechanism leading to normalization of glycaemia. Diabetologia. 40:143-149. 9. Burtis, C.A and Edward, R.A (1999): Tietz Textbook of Clinical Chemistry. W.B Saunders Company, United States of America. 12(3):114-45. 11. Cheesbrough, M. (1999): District Laboratory Practice in Tropical Countries (Part 2). Cambridge low price edition, Cambridge University Press, United Kingdom, 7(4): 65. 12. Claudio Coimbra Teixeira, C. C., Augusto Rava, C., da Silva, P. M., Raquel Melchior, Argenta, R., Anselmi, F., Chiarel Almeida, C. R., Danni Fuchs, F. (2000): Absence of antihyperglycemic effect of jambolan in experimental and clinical models. Journal of Ethnopharmacology, (71) 1–2. 343-347. 13. Cooke D.W. and Plotnick L. (2008): Type1 diabetes mellitus in pediatrics. Pediatr. Rev. 29 (11): 374–84 de la Garza-Rodea, A.S., Knaän-Shanzer, S, den Hartigh J.D., Verhaegen, A.P., van Bekkum, D.W (2010): Anomer-equilibrated streptozotocin solution for the induction of experimental diabetes in mice (Mus musculus). J. Am Assoc Lab Anim Sci. 49(1):40-4. 14. Dede E.B, Odiaa O.J., Shode F.O (2003): The pharmacological effect of extracts of West African giant snail (Archachatina marginata) on blood pressure of normotensive dogs. Afr. J. of Appl. Zool. and Enl. Biol., (5)72-74. 15. Dede, E.B., Odiaa O.J., Shode, F.O., (2003):The pharmacological effect of extracts of West African giant snail (Archachatina marginata) on blood pressure of normotensive dogs. Afr. J. of Appl. Zool. and Enl. Biol., (5)72-74. 16. Fred-Jaiyesimi, A.A., Adepoju, A. and Egbebunmi O. (2011): Anthelmintic activities of chloroform and methanol extracts of Buchholzia coriacea Engler seed. Parasitol. Res., 109: 441-444. 17. Gaski, L.A., Andrea, J., Kurt, A (1994): Prescription for extinction: Endangered species and patented oriental Medicines in Trade, TRAFFIC USA. 18. Imeuevbove, E.A. and Ademolu A.A (1988): The nutritive value of the African Giant land Snail. Archachatina marginata. J. of Animal Prod. Res. 8(2): 76 – 87. 19. Klein, B., Foreman, J.A., and Searcy, R.L. (1969): A new chromogenic substrate for determination of Serum Amylase Activity. Microsoft Publishers, 26(3): 533-37. 20. Murali B., Upadhyaya U.M. and Goyal R.K (2002): Effect of chronic treatment with Enicosistemma littorale in non-insulin-dependent diabetic (NIDDM) rats. J. Ethnopharmacol; 81: 199-04. 22. Reaven, E., Wright, D., Mondon, C.E., Solomon, R., Ho, H., Reaven, G.M (1983): Effect of age and diet on insulin secretion and insulin action in the rat. Diabetes 32, 175–180. 23. Salomon, J.A., Abdalla, S., Aboyans (2012):”Years lived with disability (YLDs) for 1160 sequelae of 289 diseases and injuries 1990–2010: a systematic analysis for the Global Burden of Disease Study., Lancet .380 (9859): 2163–96. 24. South, A. (1992): Terrestrial slugs: Biology, ecology and control. Chapmen and Hall. pp. 66 – 101. 26. Urmila, A.S. and Goyal, R.K. (2003): Effect of chromium picolinate on histopathological alterations in STZ and neonatal STZ diabetic rats. J. Cell Mol. Med. 7 (3): 322-329. 27. Vats V., Grover J.K. and Rathi S.S. (2002): Evaluation of anti-hyperglycaemia and hypoglycaemic effect of Trigonella foenum-graecum Linn., Ocimum sanctum Linn and Pterocarpus marsupium Linn in normal and alloxanised diabetic rats. J. Ethnopharmacol.79:95-100. Shi, Yuankai; Hu, Frank B (1948): “The global implications of diabetes and cancer”. The Lancet 383 (9933): 1947–1948. 28. Vos T., Flaxman A.D., Naghavi M., Lozano R., Michaud C., Ezzati M., Shibuya K., Salomon J.A., Abdalla S. and Aboyans V. (2012). Years lived with disability (YLDs) for 1160 sequelae of 289 diseases and injuries 1990-2010: a systematic analysis for the Global Burden of Disease Study 2010. Lancet 380 (9859): 2163–96.